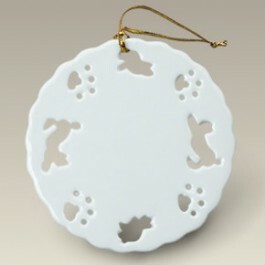 A cat lover's delight, this 3" thin round porcelain ornament is surrounded with feline designs. The cat's paw, sitting cat and stretching cat openwork is hand cut and very detailed. Kitty will appreciate it when you decorate the center section and hang it on your Christmas tree. Made in China.